We operate our own yard on 30 acres in Maraylya, one hour from central Sydney. Running on average 20-25 horses, we primarily focus on campaigning eventers for ourselves and several owners, plus we provide an elite training centre for other up-and-coming performance riders. We have been in business together since 1990 and married since 1993. We met whilst competing at 3-Day Events around Australia, and initially ran a joint agistment business in Kenthurst, NSW, 10 kms from where we live now. After successes at major events throughout Australia and Europe, we turned our focus to an Olympic dream – which was eventually realised with an exciting Gold medal in the teams event at the Sydney 2000 Olympic Games, and most recently winning team Bronze at the Rio De Janerio Olympic Games. Today, Karen (NCAS Level 2 Eventing)concentrates on running our business, coaching and training horses. 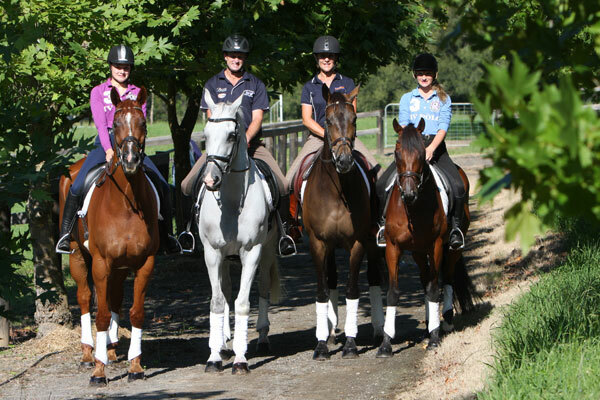 Stuart competes and trains horses at Elite level, tours Australia coaching plus Course design. Gemma has recently entered the fold of TE and is coaching from pony Club upwards. Gemma (NCAS Level 1 General) also rides and trains our horses. Here at TE with an experienced team we can ‘find you a horse’ plus help you with our mentoring program, which involves boarding your horse with us, training with us all the way to and during the competition. Jaymee is now a Macquarie University Graduate. Bachelor of Arts with a Bachelor of Commerce. She rides for a hobby and works full time in Sydney.